This method of drying carrots preserves their bright orange color, flavor, and most of the nutrients without using a dehydrator or other special equipment. Dried carrots are terrific in soups (including homemade soup stocks), stews and pasta sauces. They also take up very little space and weigh almost nothing, which makes them very easy to store. If the carrot greens are still attached to the carrots, remove them. Also remove the ends of the carrots. Compost the leaves and ends, or save them to use in soup stock. Scrub the carrots clean under running water (use a vegetable brush if you have one). Even though you may choose to peel the carrots before drying them, it is worth washing them first so that your peeler doesn't pick up dirt and spread it on the carrots (you'd have to wash them then anyway). Peeling the carrots is optional, but I almost always do because I find that carrot peels are slightly bitter in a way that detracts from the natural sweetness of this root vegetable. But if the peels don't bother you when you eat raw carrots, then they won't bother you when you cook with dried carrots. Slice the carrots crosswise into circles approximately 1/4-inch (slightly less than a centimeter) thick. Blanch the sliced carrots for 2 minutes. You can do this in a steamer or in boiling water. You can also skip this step, but your final product will lose the bright orange color of the fresh carrots. Also, the blanching step makes the carrots rehydrate quicker when you get around to using them. When the 2 minutes is up, immediately soak the blanched carrots in ice water, or run them under cold water until they are no longer warm to the touch. This step stops the carrots from continuing to cook because of residual heat from the blanching. Set a rack inside a baking dish. Place a clean mesh screen (not plastic) or a layer of cheesecloth over the rack. Arrange the carrot slices on top in such a way that none of the pieces are touching. Ideally, set the oven temperature to 125F or 135F (52C or 57C). Many ovens don't go lower than 150F/65C. If that is the case with your oven, prop its door open with the handle of a wooden spoon or a rolled up dish towel. You want to dry the carrots, not roast them. Dry until the pieces are completely dry. They will feel either leathery or crispy-dry (err on the side of crispy if you're not sure that they are dry enough). This will take 6 to 8 hours. Take the carrots out of the oven and let them cool completely to room temperature before transferring them to storage containers. If you are using plastic containers, be sure they are made of food grade, BPA-free plastic. Cover tightly and store away from direct light and heat. 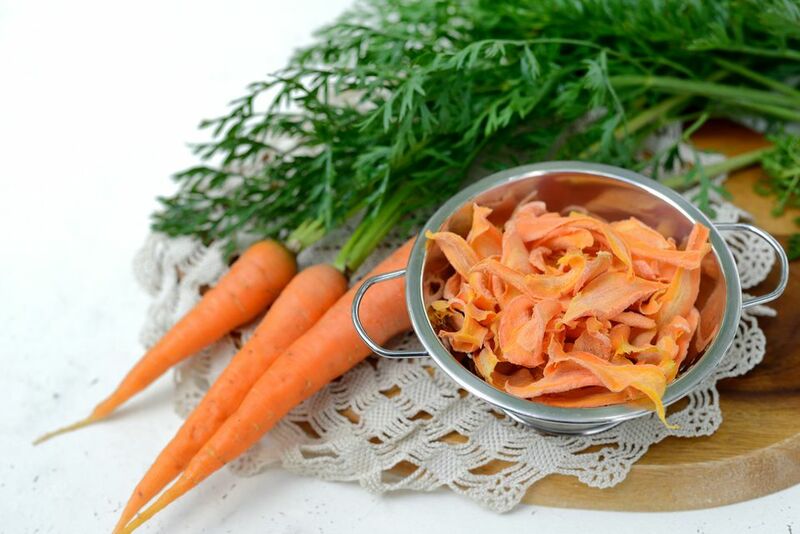 That last bit is important: dehydrated carrots exposed to light and heat while they are in storage will not only lose some of their color, they will also lose some of their vitamin A content. Rehydrate your dried carrots by pouring boiling water over them and letting them soak for 15 minutes before adding them to soups and sauces. Added directly to soups, they tend to stay pretty chewy. Use the soaking liquid as an ingredient in the soup or sauce you are using the carrots in. This liquid contains much of the thiamin, riboflavin and niacin content of the carrots, as well as quite a bit of the mineral content. And besides, it tastes good.